Do you like to unwind with an alcoholic beverage or two at the end of the work day? Are you also taking any kind of medication? If so, you may want to reconsider your Happy Hour habit. Most Americans take prescription drugs and most don’t take them as directed. 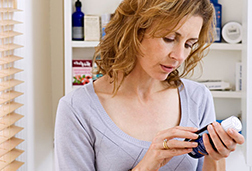 Most Americans who use over-the-counter medications take more than the recommended dose. 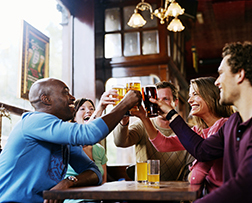 Alcohol can interact – sometimes dangerously – with hundreds of medications. These include prescription pain relievers, antibiotics and drugs that help lower cholesterol, as well as headache, cold and allergy medications and dietary supplements sold over the counter (OTC). Some of these interactions can make what you are taking less effective. For example, alcohol can weaken beta-blockers that treat certain types of heart disease. Alcohol interactions can also intensify a medication’s effects, like the sedating properties of opioid pain relievers and increase the risk of overdosing. Alcohol is also sometimes an ingredient in OTC medications – certain cough syrups, dental gels and antidiarrheals, for example. Drinking an alcoholic beverage while using one of these products can cause you to become intoxicated sooner than you would have otherwise. Alcohol/medication interactions are a serious problem. Research compiled by the U.S. Department of Health and Human Services Substance Abuse and Mental Health Services Administration (SAMHSA) in 2011 found that alcohol was a factor in about a quarter of all emergency department visits involving pharmaceuticals. Sometimes these interactions were inadvertent; alcohol and medications can interact harmfully even when they are not taken at the same time. Other times, people were trying to enhance the effects of a medication that was being used for illicit purposes. You can protect yourself from dangerous alcohol/medication interactions by always reading medication labels and by always taking medication as directed. If you have questions about taking a medication and drinking alcohol, talk to your pharmacist. You can also go towww.drugs.com/drug-interactions/ethanol,ethyl-alcohol. Information about medication interactions with other medications can be found atwww.drugs.com/drug_interactions.php. The LHSFNA’s Publications Catalogue also has a number of materials about alcohol awareness and drug abuse. Order these by going to www.lhsfna.organd clicking on Publications.